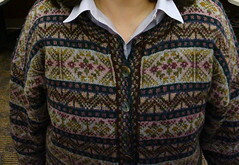 Is Fair Isle a technique, tradition, pattern, style, or geographical origin? Well, all, really, and it’s a pleasure to appreciate all its dimensions. 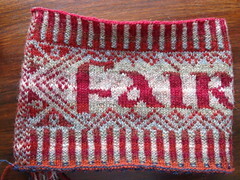 For the purposes of this post, I’d like to focus on Fair Isle knitting as a technique. Patterns developed in the Shetland Islands (of which Fair Isle is an outlying member) during its origins in the mid-nineteenth century have endured for over a century and a half, defining and enriching this remarkable tradition. How extraordinary that a pattern forged on a tiny island—then almost as Norwegian as it was Scottish—could have become an international sensation. To attribute the wide adoption of the style to Edward VIII’s decision to wear Fair Isle waistcoats on the links would do an injustice to the remarkable knitters and colorists who have knitted in the Fair Isle idiom and have made it the treasure it remains today. It is a wonderful fashion style, a compelling group of techniques, and design scheme all rolled into one, and its international popularity and frequent “citation” make it a truly global style. I remember receiving my first real Fair Isle sweater from my dear godmother; she had brought it back from a visit to the Shetlands in the early 80s. It was yellow and had a beautiful eyelet yoke pattern (something along the lines of the one in the upper left of this photo). It was clearly in a different class from the so-called Fair Isle sweaters I also admired in the L. L. Bean catalog. I treasured that sweater throughout high school and college, and when I grew out of it, my mother happily “appropriated” it for her own use. I never dreamt that I would actually be able to make one! It was another ten years before I thought I could attempt a Fair Isle sweater, and when I did, I felt as if I had come home. I immediately took to the small size of the needles & small gauge, two colors per row (my preference: one in each hand), frequent color changes, knitting in the round (who couldn’t love steeks? ), and the amazing palette of colors available in 2-ply jumper-weight yarn...all continue to appeal to my hands and heart fourteen years along. After discovering that my gauge is significantly looser when using the needle size generally recommended in Fair Isle patterns, I became somewhat obsessed with making swatches. After the second or third pattern, it was clear which needle size I needed to achieve 8 stitches per inch with 2-ply yarn, but I continued to swatch anyway. I’ve even made swatches after the fact; they seem to have become a way of documenting projects, especially when the projects go to recipients who live far away. But I also swatch to try out new colors, designs, motifs, even patterns (because colors in print do not necessarily correspond to colors in person), so I’ve accumulated quite a few (as pictured above). 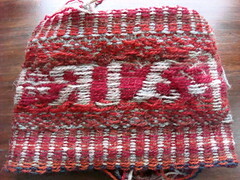 The swatch at the center top was one I made after I had finished Rona (below). So what to do with all the swatches? I have read that Kaffee Fassett crocheted together all of his swatches to create a blanket. Alice Starmore used to (and probably still does) design exclusively with swatches, rather than knit up entire garments (read her story here). She traveled with a number of single swatches, which if I recall from my Starmore workshop experience, were about 12 inches square. She advocates swatching in the round using steeks so that you don’t have to risk altering your gauge while purling the pattern on the reverse side. I think I’d like to patch together all of my swatches to create a jacket, but I don’t want to feel like Joseph & his many colored coat. Perhaps I’ll knit the squares together with a dark color in between, with the aim of treating them like stained glass or cloisonné. This past week, I’ve made a new swatch that is completely frivolous. Trying to celebrate both a knitting technique and the beauty of uncials (in manuscript, printed & electronic form), I charted out an obvious message using some key Fair Isle techniques. Enduring and widely-used, uncial letterforms were not inherently Celtic. Still, they were a preferred style in the earliest writing of the British Isles, and were used in such masterpieces of Celtic manuscript as the Book of Kells and Book of Durrow. Although not Scottish in origin, uncial letterforms became the basis for early medieval writing styles throughout the British Isles. 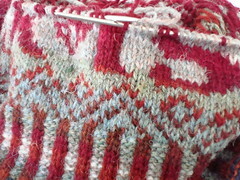 Thus they seem to convey a sense of history and tradition analogous to Fair Isle knitting itself. I looked at early manuscript examples, and at the electronic font, Omnia, and charted the design by hand on graph paper. If I had had this idea earlier, I would also have looked at the work of Victor Hammer, who created a number of metal uncial fonts for letterpress printing. Another way to knit letters in color would be to create an image file and process it through KnitPro for an auto-generated chart. Back to the swatch: I began & ended with a corrugated rib—a 2x2, two-color rib in which knit stitches are in a darker color and purl stitches in a lighter (or brighter) one. I wasn’t entirely consistent throughout with color changes, but I generally used four colors for the background and four for the foreground, saving the lightest & brightest for the center stripe, in keeping with Fair Isle tradition. 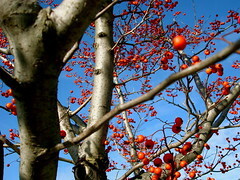 My digital camera doesn’t seem to capture reds very well, but the colors were inspired by the winterberry tree (photographed last November, above). 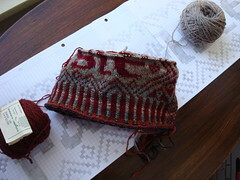 I’ve wanted for some time now to use its beautiful grays and reds for a Fair Isle sweater. For some reason, the gray yarns I chose turned out to have a slightly greenish cast, which did a nice job of highlighting the foreground/background contrast, as red sits opposite green on the color wheel. On the wrong side, strands carried behind produce a reversed version of the pattern, which you can see. The strands of color carried across the back also double the fabric’s thickness. Ordinarily, Fair Isle designs follow a logical pattern of odd-numbered stitch repeats that often produce zig-zag lines and the signature XO shapes, but knitted letters don’t quite allow that to happen. 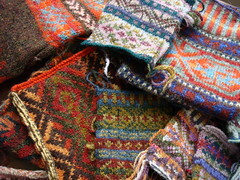 They required a lot of weaving in of strands behind the scenes (once an inch or every 8 stitches in this case, when not called upon in the design), something ordinarily to be avoided in Fair Isle knitting. 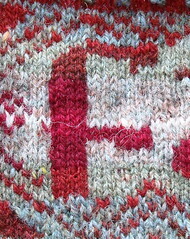 I tried to fill in around the letters with some Fair Isle-ish designs cribbed or adapted from those provided by Sheila McGregor in Traditional Fair Isle Knitting. To add to the whimsy of this swatch, I’ve created a short movie that follows the evolution of this little project from cast-on to steek-cutting. Wow! Thanks for including me in such and exalted list. I love your blog and will link to it if its OK. Cheers! I stumbled across your blog one day, was stunned and amazed by your creativity and the beauty of your work. I never thought I'd be reading it with intent, but sitting beside me is a bag of fibre to colourblend and spin for a stranded colourwork project. I fancy a fancy colourful hat! Your blog is my favorite book, my special pasttime when I have done the chores of the day, when I feel I need a soul pickup... thank you for every post!